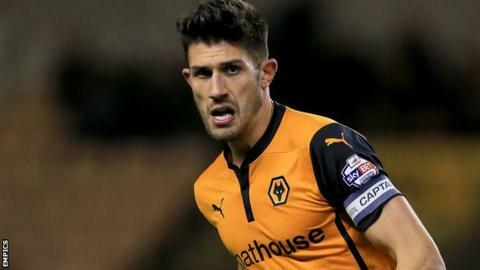 Wolves defender Danny Batth will miss the rest of the season after a scan revealed a stress fracture in his foot. Batth could be out for up to three months, meaning he will not be available for the Championship play-offs if eighth-placed Wolves qualify. The centre-back, 24, has started every league game for Wolves since head coach Kenny Jackett took charge in May 2013. "Unfortunately injuries do happen, but Danny has had a very good season," Jackett told the club website. "I know how determined Danny will be to come back strongly and how fit he will come back for pre-season. "It is unfortunate he is going to miss the end of the season but he will be working very hard over the summer to get things right." Batth has made 111 appearances after coming through the academy at Molineux and, with club captain Sam Ricketts out of favour before heading to Swindon on loan, Batth has captained Wolves for much of the season. Wolves are three points behind the final play-off spot with two games left. Meanwhile, goalkeeper Carl Ikeme (knee) has been ruled out of Saturday's match at Wigan, but winger Bakary Sako (groin) has been passed fit to play.